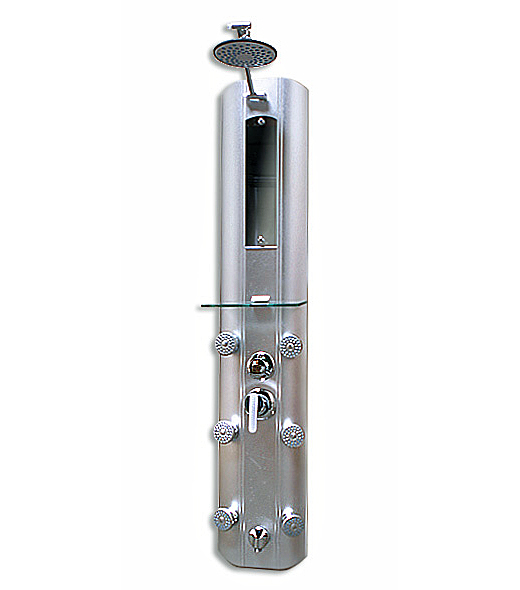 Aluminum shell brass shower panel SPA massage system (J110), BathImports 70% off Vessels, Vanities, Shower Panels. Taking a shower for some is the only relaxation time they have for themselves. Imagine that experience and multiply it by 10. For a one time low price you and your family will enjoy the benefit of having a shower panel daily. This brass fixture panel, with durable aluminum exterior shell, has 6 high power massage jets. The panel features a thermostatic valve which keeps constant temperature ready to turned on when ever. This unit has a adjustable copper alloy rainfall shower head, as well as a hand held shower wand. The shower panel was designed for ease of installation. The unit comes with 2 steel braided hoses to connect directly to your hot and cold water supply lines. The unit is mounted by 2 heavy duty brackets. * 6 hydro massage body jets. * Dimension: 52" x 11"